Note: This DIY KL kit does not include E6000 glue (click to purchase). Click to purchase the ATHENA Grecian Headband kit. 1. 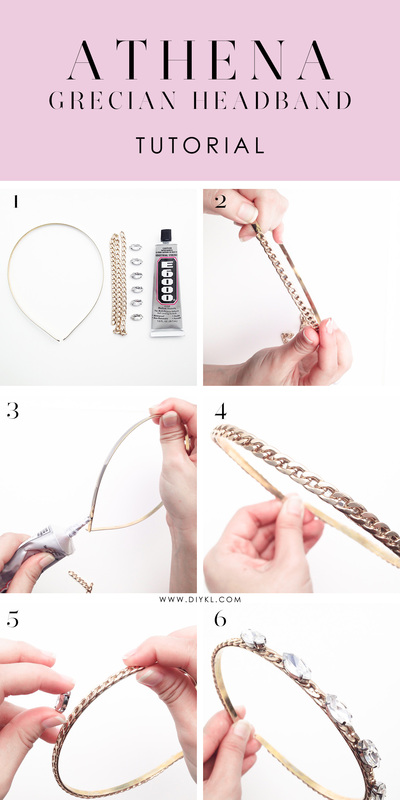 Measure the curb chain along the gold headband, and snip off any excess. 2. Using the glue, dab along the bottom of the headband going upwards and along the headband. 3. Slowly stick the chain along the upper side of the headband. Let it dry for 10-20 minutes. 4. Dab some glue onto the back of the rhinestone, and slowly place the rhinestone onto the chain. Customise the rhinestones in any way! Let the rhinestones dry before wearing your headband. Be a Greek Goddess in the beautiful ATHENA Grecian Headband which you have just made!